Gourmet all the way. This artfully crafted dipping olive oil and balsamic vinegar dipping dish framed by a ring for adding your favourite appetizers. Keep with the theme and ring your best olive oil and balsamic with your favorite olive variety, or how about some cherry tomatoes and bocconcini cheese (don't forget the basil!)? 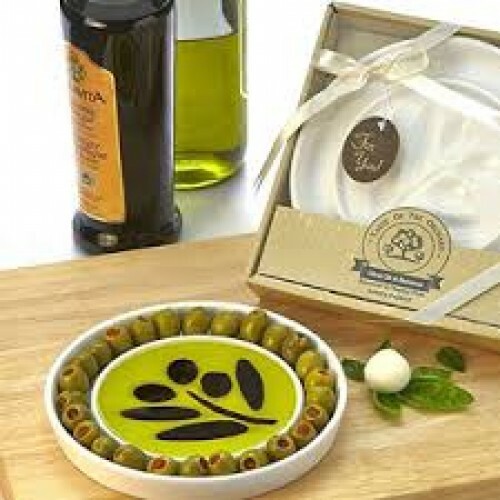 A perfect party gift and wedding favour paired with our Olive Oil & Balsamic Vinegar. Of course you'll want a few for your own entertaining! High quality porcelain dish features recessed olive branch form for balsamic vinegar which rests under the olive oil layer (for best presentation results, pour olive oil first followed by balsamic vinegar into shape). Olive orchard themed clear covered gift box with rustic Tuscan inspired art detail. Packaged favor dimensions approx. 7.0” x 7.0" x 1.5" (18 x 18 x 3.8 cm). Plate measures approximately 6.5" in diameter (16.5 cm).